Brett is president of her school’s Unity Club. When a new group home for at-risk youth opens in the neighborhood, Brett becomes friends with Jude, one of the boys who lives at the home. After a series of acts of vandalism, the community starts demanding that the group home be shut down. Brett doesn’t believe that Jude, or any of the other teens, is responsible, but when an elderly woman is seriously injured, Brett begins to have doubts. When writing this book, I drew heavily on the experiences of my daughter, Shannon, who was a member of the ‘Interact Club’ when she was in high school. Like Brett in Unity Club, Shannon and her friends volunteered at numerous local organizations, including a seniors’ home and a drop-in sports center for young children. Their passion and enthusiasm inspired me to write Unity Club. I also researched the guidelines for setting up group homes around Edmonton by speaking with a friend, who has worked in social services for many years. Before I began writing this book, most of the characters—Brett, her parents, her best friend, Jude, etc—were fixed in my mind. The best surprise however was Kaden, a complex character who seemed to appear out of nowhere and who began challenging Brett as president of the Unity Club. Kaden challenged me as well, and I sometimes felt like he was trying to take over the story. This makes me wonder if Kaden deserves his own story someday too! Is there a genre or form you’ve never written in but would like to try writing? Funny you should ask… I usually write contemporary stories about modern-day characters facing modern-day problems; however, I have recently returned to writing a middle-grade fantasy story that I have worked at sporadically for years. I am especially enjoying the freedom and challenge of creating a fantasy world filled with magical characters. Do you have any unique hobbies or pastimes? This is not especially unique, but I rely on long trail runs with my German shepherd to decompress when writing (or life) does not make sense to me. I don’t consciously think about my characters or my plots while I’m out running. Somehow though, my story problems generally sort themselves out after I return to my studio. And like many writers, I am a shameless eavesdropper! For me, the biggest challenge is finding the time and space to write all the stories that fill my head and my heart. The stories always come at me faster than I can write them! Two things most excite me about being a writer: the adrenaline rush I feel when a tiny story idea starts expanding in my head; and those incredible moments when readers connect with me to say that my story has made a difference to them. I hope that readers of Unity Club will question how they perceive people and situations around them. Have they formed opinions about others without first getting to know them? Have they based their decisions on actual facts? I hope that readers will try to stay as open-minded as possible, and to forgive or apologize to other people as warranted. 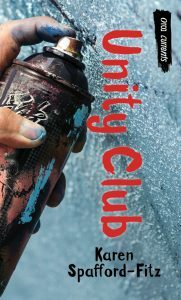 Unity Club is available now! 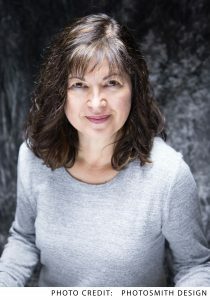 Karen Spafford-Fitz is the author of several novels for young people, including Vanish and Dog Walker in the Orca Currents series. She lives in Edmonton, Alberta. For more information, visit karenspafford-fitz.com.